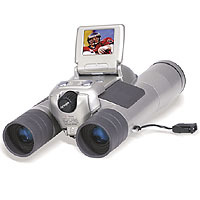 Remember the previous Digital Binocular Camera we talked about? Well, that one only had 2.0 mega pixels which can be considered pretty low for the actual standards, this one has more MPs and improved features overall. The name also stands out (when comparing to the poor DB3200), it is called Pro Viewer BinoCam, I must admit that the “Pro” part on the beginning makes all the difference, right? The photos will probably end up having a great quality because the pro cam features 5 mega pixels, a magnification level of 8x, an objective lens with 32mm of diameter, and a focus range that goes from 18 meters to infinity – all these features must produce a good final product which is the photo. While the TFT color screen measures 1.5-inches. the photos will end up with a 1600×1200 resolution which is also good and makes a good combination with the previous specifications. to make the whole product look bad, it uses USB1.1 instead of 2.0. PS – taking a better look at the product information which can be found at GadgetUniverse, the whole 5mega pixel thing looks like a marketing lie. It is just too bad that the folks at Crave can’t read the product description.